We are so thankful for Wells Fargo and their support year round. This year, they stepped up and gave in a big way through our Adopt-a-Room program. With an average of a 97% occupancy rate each year, our rooms often need some TLC. That also means at times, they must be refurbished. Thanks to the heartfelt donation from Wells Fargo, we were able to renovate a room. 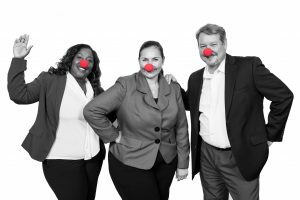 As an Adopt-a-Room donor, Wells Fargo got to take a fun red nose picture (shown below) that now hangs in the room to remind guests that the organization was thinking about them and their stay when they gave back. Our Adopt-a-Room program is key to our mission at RMHCA. While we do so much more than just provide a room, the room is one of the things that is consistent for our guest families throughout their stay at the House. They are in a city they do not know with unknown circumstances as to how long they will need to be in town. While their child may not be in a life or death situation, it is position no one can deal with easily. Their room at RMHCA is theirs — it is private, cheerful, quiet and a place they can go to escape. We are so thankful to Wells Fargo for donating towards this program. 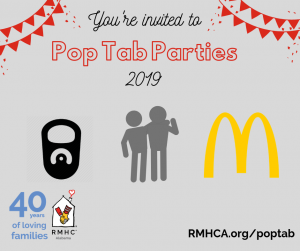 If you would like to learn more about it, or other ways to donate as an organization or company, contact Kathy Robson, Director of Development, at kathy.robson@rmhca.org or (205) 638-7269.